If you want bar patrons to use your menu, you have to make it visible. Many times patrons will order something they’re familiar with, without ever looking at your drink menu. Make menus easy to access for all your patrons. A specials board is a chalkboard, dry-erase board, or other placard that allows you to quickly write down the, um, specials each day and display them prominently for guests and staff members alike to view. You can post them by the front door, over the bar, or on an easy-to-see wall. A table tent is a small menu that stands alone on a table or at various points along the bar, with a listing of menu items. Often, table tents promote specials or list your signature drinks. Unless you have a small menu (like just a few appetizers), table tents are typically too small to list all your menu items. You can choose table tents made out of card stock that lasts for a while, and then toss them when they get soiled. Or you can buy table tent card holders made of clear plastic. You can easily swap out the cards as you change specials or decide to promote something else. Here is an example of a table tent. Don’t forget that your liquor distributors may be willing to give you table tent holders adorned with their logos for free. Make sure staff members wipe down table tent covers regularly (at least once per day, but preferably each time they bus the table). These things can get grimy, and nothing is less appetizing than thinking about ordering food only to pick up a filthy menu. Many bars have menus that include all their spirits, wine, and beer offerings. Make them available and accessible to all your patrons. Decide how visible you want your food menus. If you want to sell lots of food, make sure you have the menus out where patrons can use them. 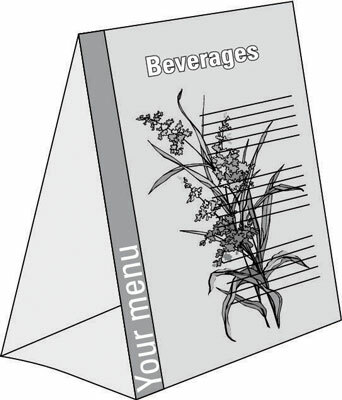 Consider including a food menu as one side of a table tent.